It took more than two centuries for the United States to have its first woman representing a major party as its presumptive presidential nominee. Last night, when it happened, when history was made, it was deeply affecting. 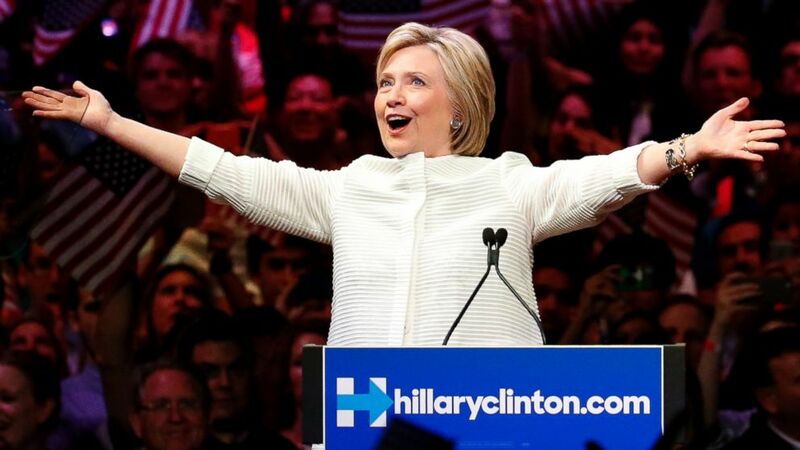 To Hillary Clinton’s many detractors, I concede her flaws, but I will not let you spoil the significance of the moment to me, to my granddaughters (though they may not know it yet), to my sons, grandsons and the rest of the country. Even Newt Gingrich said it is a “big deal…..a big moment…..a remarkable thing.” As Clinton said, the accomplishment belongs to generations. Somewhere the ghosts of Lucretia Mott and Elizabeth Cady Stanton and a couple of hundred others who participated at Seneca Falls in 1848 must be wondering why this took so long. As the New York Times put it this morning, “this achievement is worth cheering by all, regardless of party, because it further opens the door to female leadership in every sphere.” To my granddaughters I say, you can be anything you want to be, as long as you work harder than everyone around you, are smarter than those sitting to your right and left, are laser-like in your focus and have a really thick skin. If any woman can be elected President right now, it is Hillary Clinton. She has been relentless in pursuit of the office, is smarter and more experienced than any other candidate, and, by dint of having to endure a lifetime of vicious attacks, is the pachyderm the campaign requires. She is far from perfect. She is, in fact, a terribly flawed candidate, with the percentage of people disliking and distrusting her at historic levels, second only to the unfavorability rating of Donald Trump. It would be nice to have a little help from Hillary in modifying that unlikability, say, by becoming more transparent and less defensive. Wouldn’t it be nice to have the content of those speeches to Goldman Sachs, honest clarification of the Clinton Foundation finances, and resolution of the email issue once and for all? Becoming more accessible to the press, and communicating with thoughtful candor and humor could go a could go a long way in enhancing her image. But whatever her flaws, it is clear that, in addition to being history making, this election is history-shaping: it is about who we are and who we want to be as a nation. If it ends up being just a race between the lesser of two evils, there’s no contest. Trump’s “making America great again” is, as Clinton pointed out, code for taking us back to a time when prosperity was reserved for just some” and a time when “others” were shackled to second-class citizenship. It would be nice if these two candidates could debate honest policy differences, but I have my doubts we’ll ever get there. We don’t need a leader of the free world who knows practically nothing, is a fountain of erroneous information and doesn’t care about what he doesn’t know. I don’t think the Republican post mortem on the 2012 loss advised its 2016 nominee to slam every demographic but white males, stoke irrational fears, and deal irascibly with everyone who disagrees with him. House Speaker Paul Ryan and Senate President Mitch McConnell know that, regardless of what is right, common sense dictates that political leaders become more welcoming of our increasingly diverse population. Of this, Donald Trump is incapable and appears even incapable of faking it. Heaven help us all in dealing with the conflagration that could ensue if Donald Trump is elected President. If Hillary’s election would be a milestone, Trump’s could be a tombstone. This entry was posted in Politics, Uncategorized and tagged Clinton Foundation, Clinton high unfavorables, Donald Trump, Elizabeth Cady Stanton, Hillary Clinton, House Speaker Paul Ryan, Lucretia Mott, Newt Gingrich, presumptive Democratic nominee, Senate President Mitch McConnell, Seneca Falls. Bookmark the permalink. But Joe Biden is the President of the Senate. Mitch is but the Majority Leader. Great article, Margie. Hit the nail right on the head, as you usually do.